Thanks to years of news reports, advertisements and lectures from our doctors and nutritionists, most of us today are aware of minerals like iron, calcium, and potassium, and their dietary importance. While this awareness has had great benefits for general health and wellness, there are many crucial nutrients that are not so well known but are just as important. Selenium is one of these important nutrients, and while we only need a small amount to get its full effect, without it, your body can’t and won’t run at optimum efficiency. If you’re concerned you’re not getting enough, Selenium-Pro™ is the answer. Selenium is an essential trace mineral: that is, although we need it to survive, our bodies cannot make it themselves and it must instead be taken in from dietary sources. Selenium is a major constituent of a group of proteins, known as selenoproteins, which play crucial roles in reproduction, DNA synthesis, thyroid function and mitigating oxidative damage and infection. Selenium rich foods include meat, seafood, grain, cereals, milk, brazil nuts, mushrooms and garlic, though it is important to remember that the selenium content in any plant is dependent on the soil in which it was grown. Though selenium content in meat is also dependent on diet, animals require selenium themselves and as such, tend to maintain relatively consistent levels within their organs and muscles. Though selenium has been the focus of slowly increasing news coverage over the last decade, particularly as a proposed treatment for certain sorts of cancer, there is still a great deal of research to be done. That said, there are several major fields of research in which selenium has shown positive, if not conclusive, results. The most well-known of selenium’s benefits is its role as an antioxidant. The selenoproteins formed from selenium are themselves crucial to producing glutathione peroxidase, one of the body’s major detoxifiers. Glutathione peroxidase converts toxins into harmless by-products which can then be eliminated, preventing oxidative stress which reduces damage to cells and blood vessels. What happens if I don’t get enough selenium? Though acute selenium deficiency is relatively rare, the amount in our diets is steadily decreasing due to ever-more processed snacks and meals, and the expense and inconvenience of procuring a wide range of fresh foods. In fact, selenium deficiencies are slightly increasing throughout the world, and becoming a new challenge to nutritionists and health care professionals. Selenium deficiencies can result in hair loss, skin and fingernail discolouration, poor immune function, fatigue and weakness, mental fog and confusion, miscarriage, and hypothyroidism. 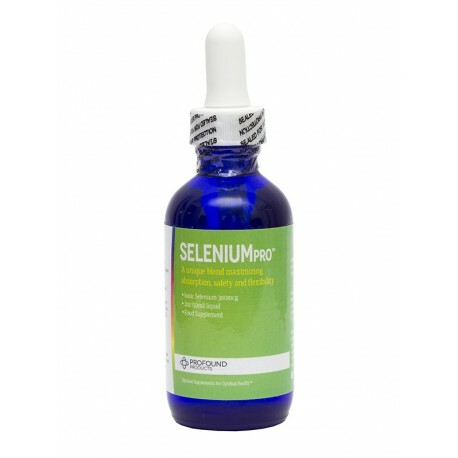 Selenium Pro Ionic Selenium is one of the simplest and easiest ways to get your daily dose of this essential mineral. Because it comes as a liquid ionic solution, your body can absorb it quickly where it’s needed most, while the metered dropper means that unlike with tablets and capsules, it’s simple to adjust dosage. Selenium-Pro™ is non-GMO, free from gluten and allergens, is vegan friendly and contains a proprietary blend of 72 sea minerals, formulated to fill any nutritional gaps you may have. When the solution is so simple, there’s no reason to miss out on this crucial mineral – try Selenium-Pro™ today. Other Ingredients: Purified water, ConcenTrace®, sodium selenate, citric acid, and less than 0.1% potassium benzoate. Also contains 72 minerals and trace minerals from ConcenTrace®.